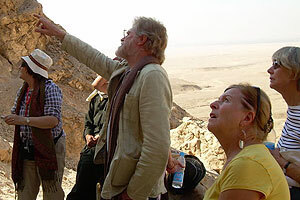 Robert Morkot explains the tomb of Harkhuf to BSS in Egypt 2011 participants. In November Egyptologist and Nubia-expert Dr Robert Morkot will be teaching Nubia: a journey through a drowned land for us in Aswan and on a Lake Nasser cruise. A new ‘BSS in Egypt’ course combining lectures and visits to ancient sites, culminating in our arrival at Abu Simbel by boat. 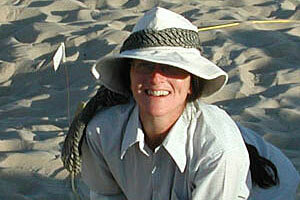 Dr Renée Friedman, Director of the Hierakonpolis Expedition. New to BSS in 2016 will be a Summer Study Day, and we are thrilled that the Director of the Hierakonpolis Expedition, Dr Renée Friedman, has agreed to bring members of her team along to BSS to tell us all about the newest discoveries at one of Egypt’s most important archaeological sites. 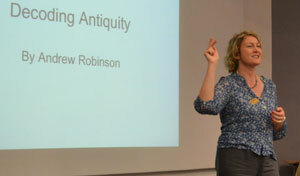 Jo Marchant at our recent study day. Our December study day was a day of intriguing lectures by award-winning science writer Dr Jo Marchant – a heady mix of DNA and other scientific analysis on the mummies of Tutankhamun and supposed members of the Amarna royal family; the extraordinary Antikythera mechanism found in an ancient shipwreck; and the world’s oldest known rock art, in Indonesian caves. 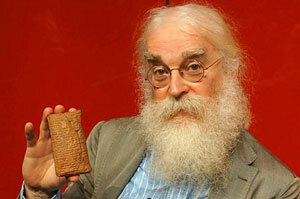 Back by popular demand… Dr Irving Finkel will give four lively and varied lectures on Saturday 5th March on one of his areas of special interest Magic and Medicine in Ancient Mesopotamia. An erudite and entertaining speaker, loved by BSS audiences. It would be great if you could join us. 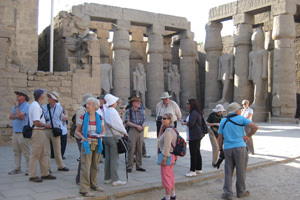 BSS group in Luxor Temple: discussing Ramesses II’s additions to Amenhotep III’s temple. 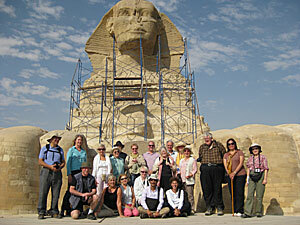 23 of us are just back from another fabulous ‘BSS in Egypt’ course in Luxor. Dr Stephen Harvey gave 10 excellent lectures on the early Ramesside Period, complemented by a range of fascinating site visits, including 'special openings' of Seti I's temple at Kanais, Ramesses II's portal temple at Kom el-Sultan, Abydos, and the extraordinary tombs of Seti I, Ramesses II, Ramesses II's sons (KV5) and Nefertari. Huge thanks to our lecturer Stephen Harvey, guide Enass Salah and tour coordinators Lee Young and Galal Alsenusy of Egypt Archaeological Tours. Professor Salima Ikram at our BSS study day on 18th October. 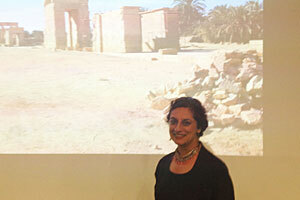 Our ‘Great Oasis’ study day was attended by 180 enthusiasts of Egyptian archaeology. Salima Ikram enthralled us with four wonderful lectures. A huge thank you to Salima for flying from Cairo to join us for this very special day. 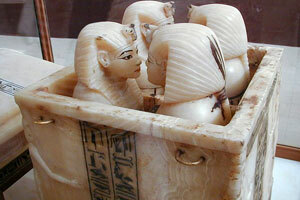 Tutankhamun’s canopic chest, Egyptian Museum Cairo. Why not combine our study day with Dr Jo Marchant on Sunday 13 December, ‘When Science and Archaeology Collide: a day of discovery’ (including a lecture on Tutankhamun’s mummy) with the Friends of the Petrie Museum study day on Saturday 12 December ‘Tutankhamun’s knickers and other knotty textile questions’. Both study days will take place in the same lecture theatre, so you can stay nearby and enjoy another Egyptology weekend in London. 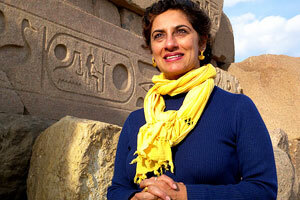 Professor Salima Ikram will be joining us from Egypt this Autumn. 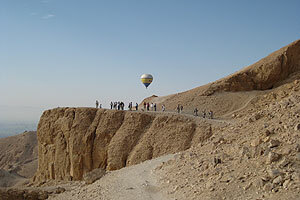 We have coordinated with London’s Egypt Exploration Society this Autumn. Why not come to London for the weekend to attend their study day, On the Trail of Imhotep, on Saturday 17 October, followed by our study day with Professor Salima Ikram, The Great Oasis: history and archaeology of Egypt’s Kharga and Dakhla Oases, on Sunday 18 October. 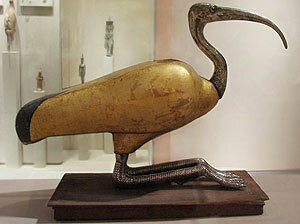 Thoth, Ancient Egyptian god of knowledge (and BSS logo). 6 courses, 8 fantastic lecturers, and 120 participants – another wonderful 3 weeks of Bloomsbury Summer Schools. Thank you all! 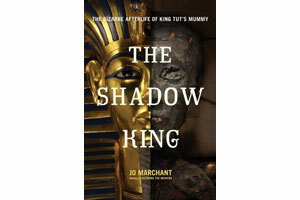 Jo Marchant’s 2nd book, praised as “luminous and illuminating” by The Guardian. Tutankhamun and Amarna royal mummies DNA, a 2000 year old computer, and the oldest known cave art. 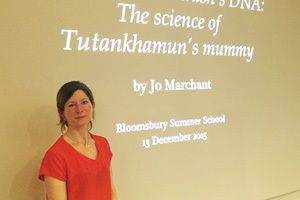 Join us for a day with Dr Jo Marchant on scientific research and the ancient world. We are very excited that one of Egyptology’s most charismatic lecturers has agreed to give four lectures at a BSS study day in October. Dr Irving Finkel at our BSS study day on 28th February 2015. 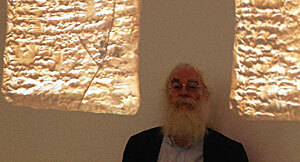 Dr Irving Finkel gave four lectures at our study day on 28th February, that weren’t just passionate, they were a tour de force. He had an audience of 190 captivated by his wit and erudition. We hope very much he’ll visit us again at BSS before too long. Dr Stephen Harvey explaining the site at a 'special opening’ of the Sphinx Enclosure (BSS in Egypt 2014). Back by popular demand ... we bring you Dr Stephen Harvey with a new course taught in Egypt on The Mighty Ramessides: Egypt’s Nineteenth Dynasty in Focus, with visits to ancient sites including tombs not usually open to visitors: those of Seti I, Ramesses II and Nefertari. 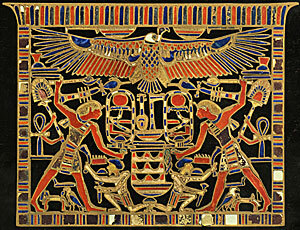 Pectoral of Amenemhat III from tomb of Mereret, Dahshur, Dynasty 12. Now in Egyptian Museum Cairo. Our six 5-day courses in July will focus on learning hieroglyphs; reading inscriptions from the Amarna Period; Old Kingdom Egyptian archaeology; Middle Kingdom Egyptian history and culture; ancient diplomacy and warfare; the Hebrew Bible and the Ancient Near East. Please do consider joining us for an intense but informal week of learning. 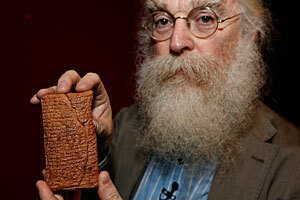 We are very much looking forward to welcoming Dr Irving Finkel of the British Museum to BSS. He is set to entrance us with the wonder of cuneiform, exploring ancient records of Mesopotamia with us, including the Ark Tablet, his exciting recent discovery. 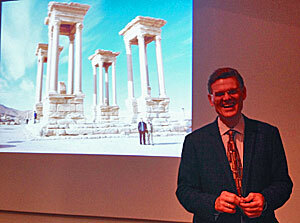 Paul Roberts takes us to Palmyra at our recent BSS study day. Senior Curator of Roman Art and Archaeology at the British Museum, Dr Paul Roberts gave four fascinating and lively lectures for our study day held on 22nd November, exploring the arts, architecture and people of Roman Sicily, Syria and North Africa. A huge thank you to Paul for his wonderful lectures, and to the 165 participants who created such a sociable atmosphere that day. BSS students lucky enough to get between the paws of the Sphinx! Our course on Pyramids was accompanied by many visits to Old and Middle Kingdom pyramids, many of which were opened specially for the group. We would like to thanks Dr Stephen Harvey for 10 superb lectures, Enass Salah for all her wonderful guiding at the sites, and Galal Alsenusy and Lee Young of Egypt Archaeological Tours for all they did to make the course/tour run so smoothly. And a huge thank you to the 17 of you who chose to join us for a great time in Egypt! Dr Paul Roberts comes to us still reeling from the success of his Pompeii exhibition at the British Museum, and back by popular demand following his extremely well received BSS study day in 2012. This time he will bring to life some of the most fascinating of the southern and eastern provinces of the mighty Roman Empire. 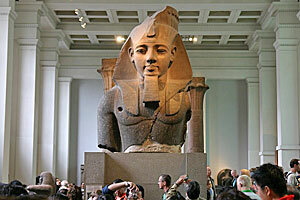 Four of our courses this year included learning experiences in the British Museum. Our summer schools are over for another year and we have a great deal to feel good about. We had over 130 participants join us across our six courses. 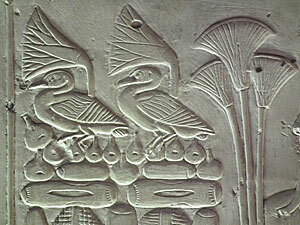 Our Hieroglyphs for Beginners course sold out and our Advanced Hieroglyphs course came close to being fully-booked. Our hieroglyphs teachers Bill Manley and José-R. Pérez-Accino were deemed outstanding, and our other course directors - Lloyd Llewellyn-Jones, Jan Picton, Claire Malleson and Garry Shaw - were all considered fantastic too. So thank you all for another successful programme of summer courses. 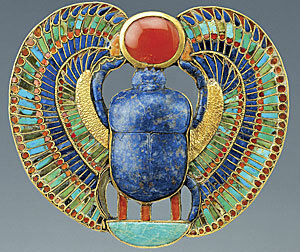 Tutankhamun's pectoral, found in his tomb, now in Egyptian Museum Cairo. This unique tribute to Howard Carter in the 75th year since his death will be a day of lectures by John Wyatt and Lee Young on Thursday 24 July, deriving from current research and revealing largely unknown but important aspects of the Norfolk man’s life and work. Attend the study day and visit a week-long exhibition of artefacts and related paintings, augmented by original film and rare recordings of Howard Carter and his colleagues describing their discoveries, together with travel diaries and other ephemera never before exhibited. Our May study day, Kingship and the Gods: the origins of Egypt, Mesopotamia and Iran, brought together 160 participants and 4 excellent speakers (Paul Collins, Alice Stevenson, Jacob Dahl and Kathryn Kelley) for a day of current research and new ideas. Dr Alice Stevenson and Dr Michael Dee fascinated us at our March study day. 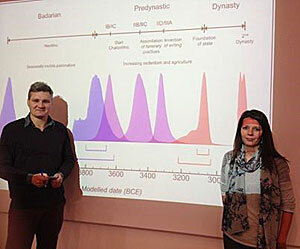 Our March study day on A New Chronology for Ancient Egypt brought us ground-breaking new research. We're very much looking forward to our May 10th study day on Kingship and the Gods: the origins of Egypt, Mesopotamia and Iran. We are also thrilled to be offering TWO Spring study days focusing on the latest research into the emergence of the great civilisations of Egypt, Mesopotamia and Iran. 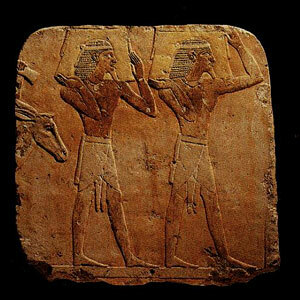 We will be offering six 5-day summer courses on Ancient Egypt and the Ancient Near East again in 2014. The dates will be 14 July – 1 August. Two of our courses will focus on reading hieroglyphs, one for complete beginners and one for experienced readers. Full details will become available very soon. 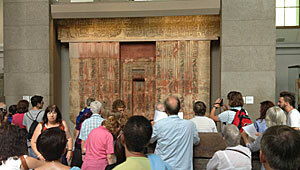 BSS students translating the inscription of Ptahshepses in the British Museum. Our six annual summer courses have sadly come to an end, but they were much enjoyed by over 100 participants, and we are busy planning our 2014 programme of courses on Ancient Egypt and the Ancient Near East. Deputy Director Lucia Gahlin introduces our first speaker of the day. Our study day on May 11th was certainly a day to get our teeth into. ‘Lost Languages: the enigma of the world’s undeciphered scripts’ was attended by 155 enthusiastic participants keen to find out more about a fascinating subject. We didn’t come away disappointed! 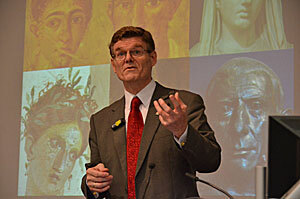 John Romer gave ten fascinating and thought-provoking lectures on A History of Thebes. 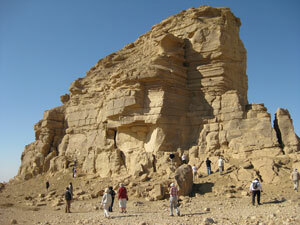 He explained the lesser-known features of the Theban landscape. We visited many sites including some usually closed to visitors, including Medamud, Malqata, the temple of Mentuhotep at Deir el-Bahri, and the tomb of Antefoker/Senet. An exciting time was had by all. Dr Gunter Dreyer, director of excavations at Umm el-Qaab, explains the tomb of Djer to the BSS group. 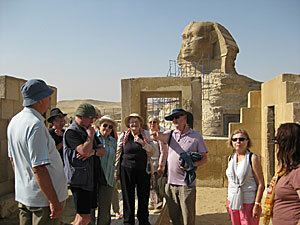 We're just back from a really fantastic BSS in Egypt with 30 participants. An exciting and innovative course taught in Sohag and Luxor, Abydos and Beyond: a sacred landscape, with daily exploration of fascinating rarely-visited ancient sites, including nine sites usually closed to visitors. A huge thank you to our lecturers Stephen Harvey and Bryan Kraemer, our guide Yusuf Ramsis, and the tour arranger from Egypt Everywhere who made it all happen, Galal Alsenusy. 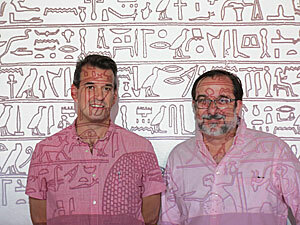 BSS Hieroglyphs students with Bill Manley and José Pérez-Accino at the British Museum (Summer 2012). Photo: Louis-Phillip Belle-Isle. Immerse yourself this summer in Ancient Egypt and/or Iran. We offer 5-day courses on ancient languages, art, history and archaeology. 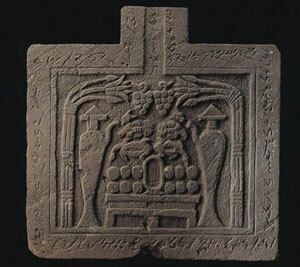 Meroitic on an offering table from Meroe, MFA Boston. Our next study day has been inspired by Andrew Robinson’s fascinating book Lost Languages: The Enigma of the World's Undeciphered Scripts, and we are delighted that this distinguished writer will be giving two of the lectures. 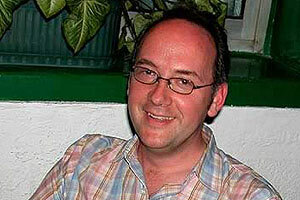 He will be joined by specialists Professor John Bennet and Dr Robert Morkot. 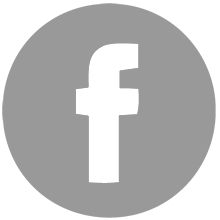 We have recently invited Bryan Kraemer to team up with Stephen Harvey, to add additional insights and to give the final two lectures of the programme. Bryan's doctoral thesis is on Abydos as a Place of Ritual Performance and Religious Imagination in Greco-Roman Egypt at the University of Chicago. 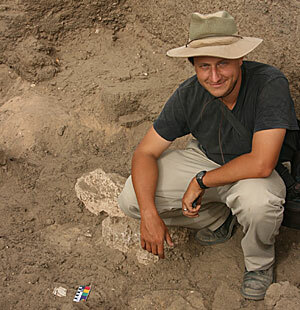 He is also a member of the Ahmose and Tetisheri Project and the University of Pennsylvania Expedition to South Abydos, so with Bryan's knowledge complementing that of Stephen's, he'll be a great addition to the BSS in Egypt 2012 experience. 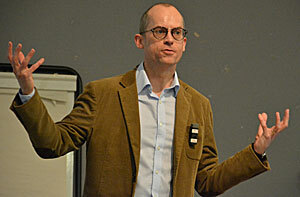 Dr Paul Roberts, Curator of the upcoming exhibition at the British Museum, Life and Death in Pompeii and Herculaneum (28 March – 29 September 2013) gave us a brilliant study day on these two Roman towns, and the exhibition itself. The160 of us able to attend the day are now incredibly well-prepared for seeing the exhibition, and can’t wait …! 120 participants of all ages and backgrounds joined us for our summer schools this year. Professor Barry Kemp’s course on ‘Akhenaten, Nefertiti and the people they ruled’ was particularly popular, but the feedback was fantastic for all six courses. We will be announcing our 2013 summer courses towards the end of this year. Following the success of John Romer’s 2010 BSS in Egypt course, we bring you a NEW course taught in Luxor with daily lectures and exploration of ancient sites. 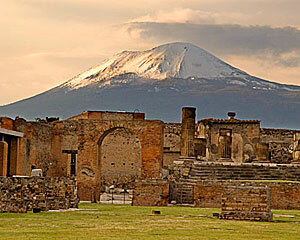 Next year the British Museum will stage an important exhibition on Pompeii and Herculaneum. The curator of this exhibition, Dr Paul Roberts, will give us a day of lectures entitled Pompeii and Herculaneum AD 79 (Vesuvius, Naples, London). The timetables for our summer schools are now available for your perusal. If you like the look of a course, go ahead and book as time is running out. ‘Akhenaten, Nefertiti and the People they Ruled’ is fully-booked, and ‘Daily Life Rituals in Ancient Egypt’ is nearly full, but there’s still plenty of choice, so take a look …. 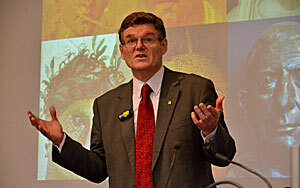 John Romer rarely lectures but on May 12th he gave four lectures for us on his latest research. Almost 300 of you attended this study day entitled Ancient Egypt: myth and history, and all agreed that John’s beautifully illustrated lectures were fascinating, entertaining, and wonderfully thought-provoking. If you would like to read John’s latest theories, then you will find them in his new book: A History of Ancient Egypt: from the first farmers to the Great Pyramid. We can now announce that Dr Bill Manley will be joining Dr José-R. Pérez-Accino to co-direct our two hieroglyphs courses this year. This is exciting news because Bill is known to many as one of the world’s leading teachers of hieroglyphs, and he is co-author of the acclaimed ‘How to Read Egyptian Hieroglyphs’ used as the textbook for our Hieroglyphs for Beginners course. In response to popular demand, we are offering a course on Abydos directed by Dr Stephen Harvey, who has excavated at the site since 1988. Ten lectures and daily visits to relevant ancient sites, including nine sites usually closed to visitors. 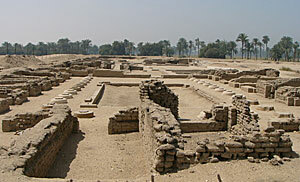 Barry Kemp’s excavations at the North Palace, Tell el-Amarna. 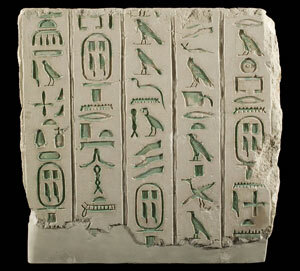 Why not study hieroglyphs with us, whether you are a beginner or old hand. 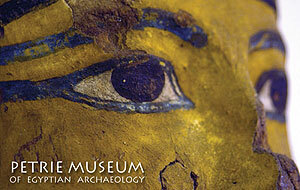 You could focus on a popular aspect of Egyptology with us – religion, the Amarna Period or warfare. If your interest is the Ancient Near East, you could study life in Ancient Iraq with us. 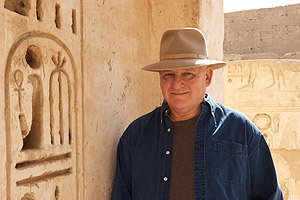 John Romer at Medinet Habu. 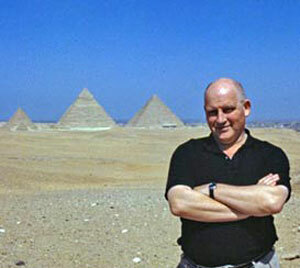 John Romer is known to many through his inspiring television programmes and books such as Ancient Lives, The Valley of the Kings and The Great Pyramid, but rarely lectures these days. So we are thrilled at BSS that he has agreed to give not one but four lectures on his latest research for our Spring study day on Saturday May 12th. 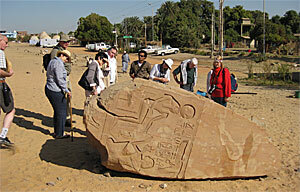 BSS students examine Seti I's broken obelisk at Qubbet el-Hawa. We are just back from a wonderful week in Aswan: Dr Robert Morkot, an expert on Nubia, gave a series of lectures on Abu: Gateway to Nubia. Our exploration of the archaeological sites of Aswan was comprehensive (even visiting some additional sites not on the original itinerary) with Robert always on hand to share his insights. A huge thank you to Sinusret Travel, our guide Galal Alsenusy and Robert Morkot. 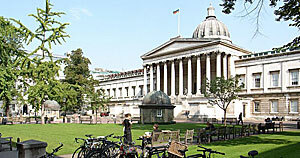 Our courses take place here at UCL. We are busy planning six exciting summer schools for 2012. We’re not quite ready to announce details. But we can tell you that we will be avoiding a clash with the Olympics by staging our summer courses slightly earlier next year. So we will be running six courses over the three weeks: 25 June - 13 July. 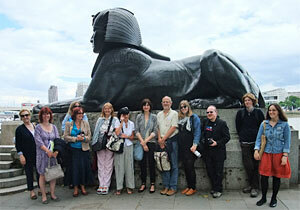 'Perceptions of Egypt' group photo taken on their 'Egypt in London' walk and talk. 130 students of all ages and from around the world joined us in July for our six inspiring summer courses. This year we offered courses on Egypt's Predynastic Period and Old Kingdom; the art, literature and perceptions of Ancient Egypt; and the archaeology of the Ancient Near East. 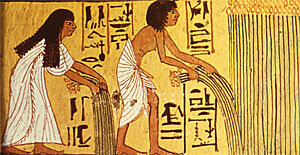 Sennedjem and his wife Iyneferti harvesting flax; their tomb wall, Deir el-Medina. 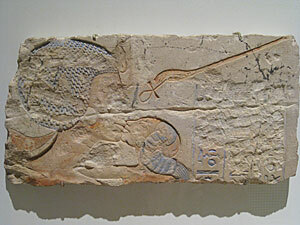 Bloomsbury Summer School enjoys a close association with the Petrie Museum of Egyptian Archaeology. You don’t have to be taking one of our summer schools to attend this year’s Petrie Summer Lecture: Dr Francesco Tiradritti on Egyptian Wall Painting, followed by a reception in the Petrie Museum, on Wednesday 27th July at 6.30pm. 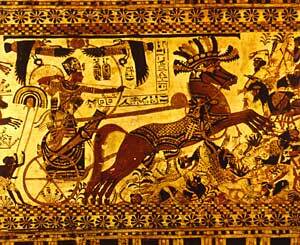 Tutankhamun firing a composite bow in his chariot. Decorated chest from his tomb, Egyptian Museum Cairo. 160 people attended our 2011 study day on May 14th. The lectures given by Dr Stephen Harvey, Dr Ian Shaw and Dr Keiko Tazawa were stimulating and the ambiance genial. Look out for announcements about our 2012 Study Day. Bloomsbury Summer School is delighted to promote the latest digital publication by Desert RATS: Rock Art Topographical Survey in Egypt’s Eastern Desert. We are delighted to be reinstating our annual study days. This year's looks set to be as fascinating as ever: The Hyksos Legacy: Technology, Arts, and Culture in the Age of the Chariot. Come and join us for a week exploring the remarkable art of Ancient Egypt from a most interesting perspective with Dr Stephen Harvey. This course replaces Shining colours out of fire: Glass and glazes which we have had to cancel because Professor Thilo Rehren has been recently appointed Director of UCL's new campus in Qatar, for which we extend to him the warmest congratulations. We will be heading off to Aswan in December for a series of lectures on Egypt’s relations with Nubia taught by a renowned expert on this subject, Dr Robert Morkot. 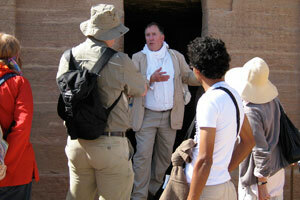 The course will be combined with daily visits to relevant ancient sites. You can now pay for courses here on the website using PayPal – a quick, easy and secure way to pay. Alternative payment methods are still cheque, cash or money transfer. 32 BSS students have recently returned home after a wonderful week spent in Luxor enjoying 10 lectures by John Romer on Deir el-Medina and the Valley of the Kings, and visiting a great selection of archaeological sites including a special opening of the tomb of Seti I in the Valley of the Kings. 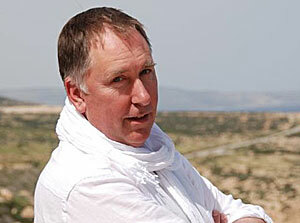 BSS would like to thank John for his entertaining and thought-provoking lectures, and comments at the sites; our wonderful Egyptian guide Hani Al Bagoury; and Margaret Davies and Galal Alsinusy of Sinusret Travel for all their organisation and smooth-running arrangements. Photo: BSS students following in the footsteps of the Deir el-Medina workmen. The start of a new academic year heralds exciting changes. Bloomsbury Summer School and Bloomsbury Academy have now merged as Bloomsbury Summer School, and so Lucia will now be organising both courses and study days. We are also launching our new logo – an ibis chosen for its association with Thoth, the ancient Egyptian god of writing, knowledge, scribes and scholars. Our eight summer courses in London this year were enjoyed by 120 students. Highlights included the opportunity to handle objects from ancient Egypt and Cyprus; sessions taught in the Petrie Museum, British Museum and Egypt Exploration Society; illuminating lectures; parties in the Petrie Museum and UCL's Institute of Archaeology. You will find information about our 2011 courses here on our website in November. This year BSS students were able to handle Late Bronze Age objects from Cyprus at the British Museum with Course Director Thomas Kiely. The Petrie Museum is one of the world’s most important collection of Egyptian antiquities – around 80,000 objects housed here at UCL – and Bloomsbury Summer School students enjoy special-access classes taught in this extraordinary museum Handling an object from pharaonic Egypt really is a rare and special experience. 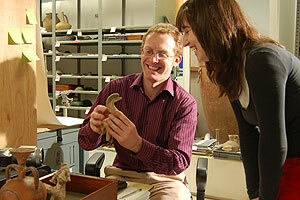 Four of our eight courses this year include object-handling sessions. If however you can’t get to the Petrie Museum you can always view its entire collection on-line: www.petrie.ucl.ac.uk and you can support the continued preservation of these remarkable antiquities by joining the Friends of the Petrie Museum: www.ucl.ac.uk/FriendsofPetrie. 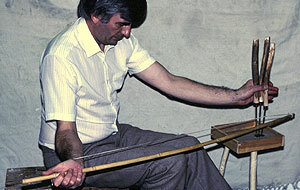 Denys Stocks demonstrates the experimental use of reconstructed multiple bead drilling equipment. Here at BSS we are always pleased to be joined by new course directors offering new courses. One of our new lecturers for 2010 is Dr Kasia Szpakowska. We enjoyed her book Daily Life in Ancient Egypt: Recreating Lahun so much, that we have asked her to teach a course on Living in Lahun: Private Life in Ancient Egypt. UCL’s very own Petrie Museum houses an extremely important collection of objects from Lahun, so this course will include object-handling classes in the Petrie Museum. Kasia is a Senior Lecturer in Egyptology at Swansea University, Wales. She is one of the organisers of the Experiment and Experience: Ancient Egypt in the Present a conference held in Swansea, 10 – 12 May. 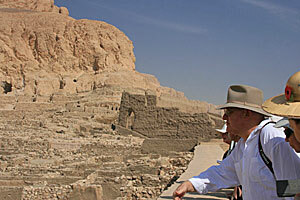 John Romer in Ramesses III’s temple at Medinet Habu. 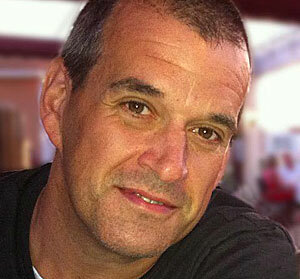 We are excited that John Romer has agreed to teach an innovative course for us in Luxor. His lectures will be supplemented by visits to many of the archaeological sites on Luxor’s east and west banks, including a special opening of Seti I’s tomb in the Valley of the Kings. 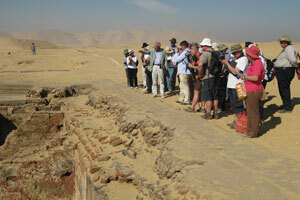 Photo: Barry Kemp explains Amarna Boundary Stela U (P Lynn). 2009 was the year we launched BSS in Egypt, and the idea proved so popular that we repeated our first course five weeks later. So, Professor Barry Kemp directed Exploring Amarna: Akhenaten’s Abandoned City twice, with a total of 44 BSS students attending his courses in Minya, the closest large town to Tell el-Amarna in Middle Egypt. BA's Autumn Conference on Archaelogy and the Bible, which focused on the Old Testament, was held in UCL on Saturday 24 October, in the presence of an audience of over 220. Bloomsbury Summer School offers you in-depth study of ancient Egypt and other areas of the ancient world, by incorporating a range of disciplines into our programme of courses. Many people find one of the most fascinating of these is forensic archaeology. 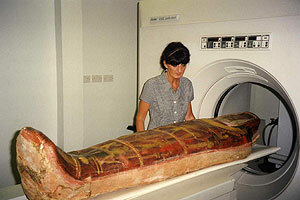 In 2008 ‘mummy expert’ Joyce Filer directed a very successful BSS course: Health, Disease and Medicine in Ancient Egypt. 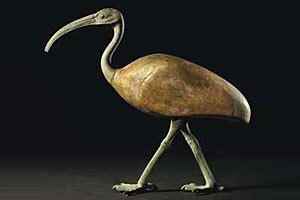 This year she made valuable contributions to our Ancient Nubia and Fauna of Ancient Egypt courses. Joyce is a font of knowledge and a lively speaker. You can join her for a study day on the Forensic Aspects of Ancient Egypt in London on Saturday 31st October 2009. 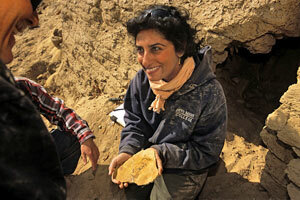 Our course directors and visiting lecturers are often archaeologists active in the field. 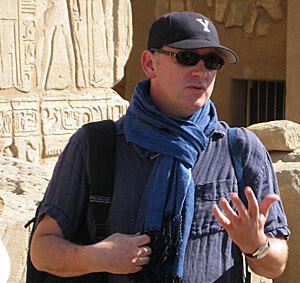 Ian Shaw, one of the course directors for Technology in Ancient Egypt is Director of the Gurob Harem Palace Project (GHPP) in Egypt. Following another successful season at Medinet el-Gurob in April Ian updates us: "We continued to work on the first comprehensive map of this large New Kingdom palace, town and multi-period necropolis, using the latest GIS software. We re-excavated areas of the town site, revealing traces of at least one kiln possibly used for working glass during the New Kingdom. 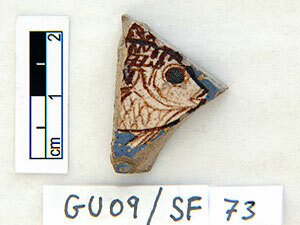 Among the more unusual surface finds this season were a faience scaraboid of a duck with its head reversed; a fragment of a late 18th-Dynasty blue glass vessel with feathered design in yellow, black and white; a small tile decorated with a fish in cream and brown glaze (pictured here) similar to those found at Amarna; two ‘lady on a bed’ figurines; and two fragments of shabtis (one in faience and one of Nile silt clay)". If you would like to find out more about this fascinating project or make a donation to it, or perhaps arrange to make an exclusive visit to the site during the 2010 season, contact Ian Shaw (ishaw@liv.ac.uk) or Jan Picton (j.picton@ucl.ac.uk). BSS combines a unique range of learning experiences and teachers. 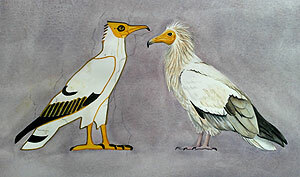 This year we have wildlife artist Jackie Garner teaching two sessions on the Fauna of Ancient Egypt course (6-10 July). All BSS students are invited to attend a special Private View of Wild about Egypt, an exhibition of Jackie’s wildlife paintings inspired by pharaonic art, on Tuesday 14th July, 6-9 pm at The Coningsby Gallery, 30 Tottenham Road, London W1T 4RJ. You can also visit the gallery daily, 12-18 July. If you miss it in London you can always see it at the Nature in Art Museum in Gloucester (11-30 August) where it is showing alongside Egyptian Landscapes, an exhibition of Egyptian tapestries from the Ramses Wissa Wassef Art Centre in Egypt.